The illegal being arrested, and the woman giving free advice, ("free" that is, if you're not a net taxpayer) are clearly Hispanic. 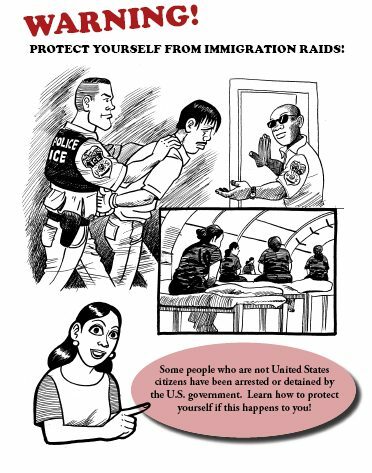 The point of this pamphlet is to help illegals stay in the US, through litigation, and various forms of resistance. This next image gives one of them. The plan here, for legal immigrants and even American citizens to refuse to say that they're legal is partly to use up enforcement resources, by making hard to distinguish the legal from illegal immigrants, and partly political, because it's always good sob story stuff when anyone who's either legal or an American citizen gets detained even for an hour in an immigration raid. The motivation for the legal employees to cover up for the illegals is presumably racial solidarity. In Alien Nation Peter Brimelow wrote that if the government ever actually did anything do enforce the law, the "moral pressure" would be intense. To this, the American answer must be: tough. Life is unfair, as another Democrat—President John F. Kennedy—once memorably noted. Representative Serrano has, presumably, ample means to prove his identity. I will be happy to do the same (I don't mind now, actually) when there are 2 to 3 million illegal Englishmen crossing the border every year. Could any American politician be so callous? Well, do they want to keep their country?